Yes, its better than a leaf blower - they just move the leaves and garden stuff from one place to another. This guy has decided on something better than that. 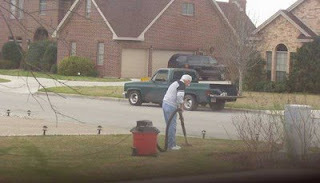 I'm guessing he is vacuuming up all the loose grass that he has just cut.